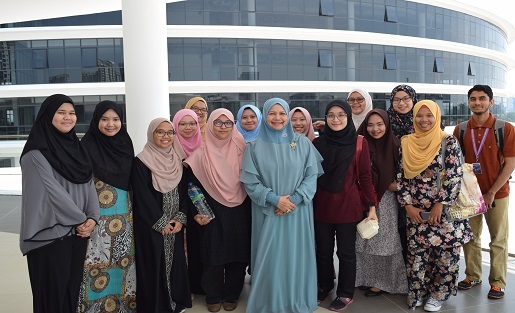 Cyberjaya University College of Medical Sciences (CUCMS) Distinguished Lecture Series which took place on 15th March 2019 featured Professor Dr Muhaya, a renowned guest speaker, motivator, lifestyle coach and Chairperson of the Malaysian Medical Association Ophthalmological Society. Approximately 200 individuals including CUCMS’s staff and students participated in this session. Professor Muhaya began her lecture session by sharing her experience as a medical student and the habits she had developed from an early age that led to her success today. She also shared her resilience in overcoming obstacles especially in terms of limited access to technology and innovation when she was a student. Professor Muhaya addressed essential issues based on the topic of How to be a Good and Successful Student”. Among the key points discussed were the 6 C’s that determines a good student which are clarity, confidence, creativity, critical thinking, collaboration and compassion. She stressed on the importance of applying it alongside one’s career path and in one’s social life. Apart from that, Prof Muhaya also provided an in-depth explanation on how understanding where one wants to be in 5 years from now can benefit the audience in becoming a better member of society. She indicated that students these days suffer from low confidence because they label themselves based on exam results and peer comparison and this may suffer negative outcomes affecting the individual and the community in the long run. As a solution, Professor Muhaya stated that university students, especially those enrolled in the health and science programmes must embrace individuality and understand that they are on an important mission in life to serve mankind. Approaching the end of the lecture, Professor Muhaya urged audiences to reset their minds and reminded them that “whatever you do must be done with the right intention and your intention creates reality”. The lecture session was held mainly to incorporate positivity among those present. The CUCMS Distinguished Lecture Series features influential speakers from the academia, public sphere and industries who share their unique perspectives on critical topics of interest. The series aims to broaden the educational experience of the university community as well as members of the industry while providing a platform for the healthy exchange of ideas.